Was visiting the Abbey and this was right next door. I didn't fancy any of the beers here so we didn't stay. The pub was large and quite full. In fact there were more people in the pub than the abbey. Lunch stop on a long and tiresome journey back to Kent. Busier than last week.Good. Kingstone - Tewdric's Tipple Ale 3.80 Sturdy session bitter.Herbal hops. Lunch stop on a long and trying journey to West Wales.Many tourists like us in the bar or garden. Kingstone - Tewdric's Tipple Ale 3.80 Oat straw session bitter.Chewy hops,long dry finish. 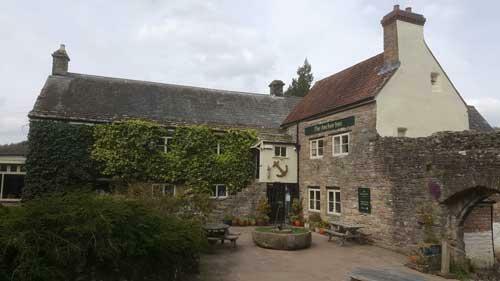 The pub is found in Tintern, Gwent, NP16 6TE. L-shaped stone built pub close to the ruins of Tintern Abbey. With monastic origins, a cider press in the bar is claimed to date from the time of the holy brothers. We have visited this pub 3 times, seen 6 different beers and tried 1 of them.